Let's get Aquaman off the endangered species list. He's the King of the Seven Seas, one of the most recognisable characters in comics, and just flat out cool. Somehow though he never seems to get the break or support he deserves, but that could all change this February, especially if you dive in. Lead by Rob at the Aquashrine blog, we are encouraging all fans of Aquaman past, present and future, to pick up a copy of Februarys Brave and the Bold #32. 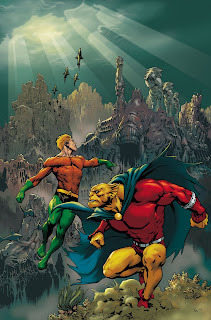 Here 'Thor Restorer' and fan-favourite scribe J. Michael Straczynski is set to pair 'Classic Aquaman' with Etrigan the Demon, in a one-shot story that doesn't do to much harm to the wallet. An extra comic to the pull-list isn't as easy to add as it used to be, but if you can join us in sending DC the message that there are Aquaman fans out here and we want to see him returned to the pages of DC Comics, your support will be greatly appreciated. Hey, appearing in Brave and the Bold lead to the Justice League and Suicide Squad getting their own books, can we hope any less, for this iconic hero? As you place your order with your LCS, feel free to add this banner Rob designed to your own blog, in the hopes of encouraging others to do the same. Plus if you know someone who will be looking for some decent escapism once the festive new year craziness reaches an end, then you might want to grab an extra copy for them to - after all it's never to late to be an Aquaman Fan. Sweet post, my friend. Extremely well written, and you make a convincing case! Glad you liked it Rob! If it helps even in the smallest way to help get my monthly dose of Aquaman back it's worth it, and just being part of something positive like this is awesome in itself.